You are here: Home / Writing / Essays / Meditations on Craft / Fail faster! Once upon a time, people developed software using the “waterfall” model.Â They would carefully write up a 30+ page specification for the product, and then they would spend a long time – several months to years! – developing the product to match the specification. Then, of course, they would discover that the market had changed, or they had guessed wrong when they built the feature.Â And they would sigh, go back to work, and develop another 30+ page specification for the next release, which would come 6-18 months later and have the exact same problem. And thus, the Agile development methodology was born.Â Instead of releasing monolithic software every 18 months based on an encyclopedia-size specification, software development teams produce working software in short development cycles (two weeks is considered optimal).Â At the end of the cycle, you demo your software to the customer, and get their feedback.Â Based on that feedback, you decide what to build in the next cycle. The advantages of working this way are pretty obvious: you can only get so far off-track in two weeks, so mistakes are cheap, and because you are constantly getting feedback about your product, you can build something that will be much more useful to the customer/better suited to the market.Â Many if not most software teams are now using variants of this method. So why am I talking about this in an artist’s blog? At first blush, this seems silly.Â Why would you want to fail faster?Â We all want to succeed, don’t we? But the truth is that mistakes are inevitable.Â What we want to avoid is expensive mistakes – ones we don’t find out about until the very end of the process, when it’s too late, or very expensive/labor-intensive to correct.Â We’ve all had projects that turned out to be disasters – like the mohair coat I spent months constructing, only to discover that the buttonholes weren’t placed correctly so the coat gapped open! The point of “Fail Faster” is that we shouldn’t try to avoid making any mistakes.Â Instead, we should try to make our mistakes as inexpensive as possible – “Fail faster!” means identifying your mistakes – aka failures – faster, so they will be quicker and easier to fix.Â The point of the shorter development cycle is that it allows discovery and fixing of mistakes much more quickly than if you did the whole thing at once. Now, how does this apply to the fiber arts?Â It’s all about the dreaded “S” word…sampling. 1st simulation. Painted warp stripes against a solid background. Here the painted warp ends alternate with solid color ends in groups of 3 inside the painted warp section, producing a striped effect. 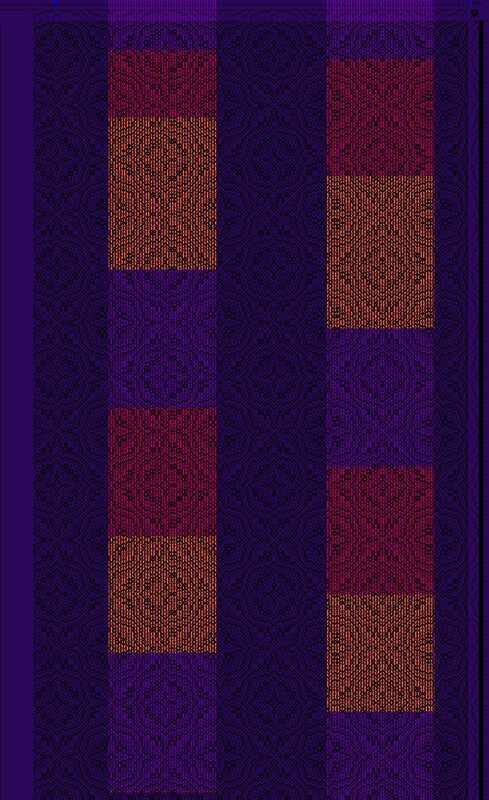 I didn’t like this design, and won’t be using it in my project.Â But notice that, by sampling it via Photoshop, I only took about 10 minutes to discover I didn’t like it.Â This mistake was far less costly than if I’d sat down and woven a physical sample, or, worse, woven up an entire piece!Â I “failed faster” using this simulation/sample, and it saved me a lot of time and grief. Sampling is a way of reducing risk.Â Instead of developing a monolithic project to a set of untried specifications – basically, using the waterfall method and gambling everything on a single throw of the dice – sampling allows you to develop things iteratively, trying out new ideas and fixing mistakes in short development cycles.Â The bigger the project and the more uncertainty around it, the more value there is to sampling.Â It’s as simple as that.